After a slight hiatus, it feels damn good to be back! You might recall that I’ve been going through some personal stuff, but I’m starting to feel like my old self and with celebrating my 26th birthday with some of those that mean the world to me, I feel more grounded, centered and in the right headspace to take things head on. With jet-setting around the world, I barely had time to process the fact that my birthday was this month, let alone to request any pieces in this Fix. My stylist Caitlin hooked me up with some fillers for my work wardrobe. Like always, she tried to urge me out of my comfort zone with some bold colors and I think with a refreshed perspective, she might be right! 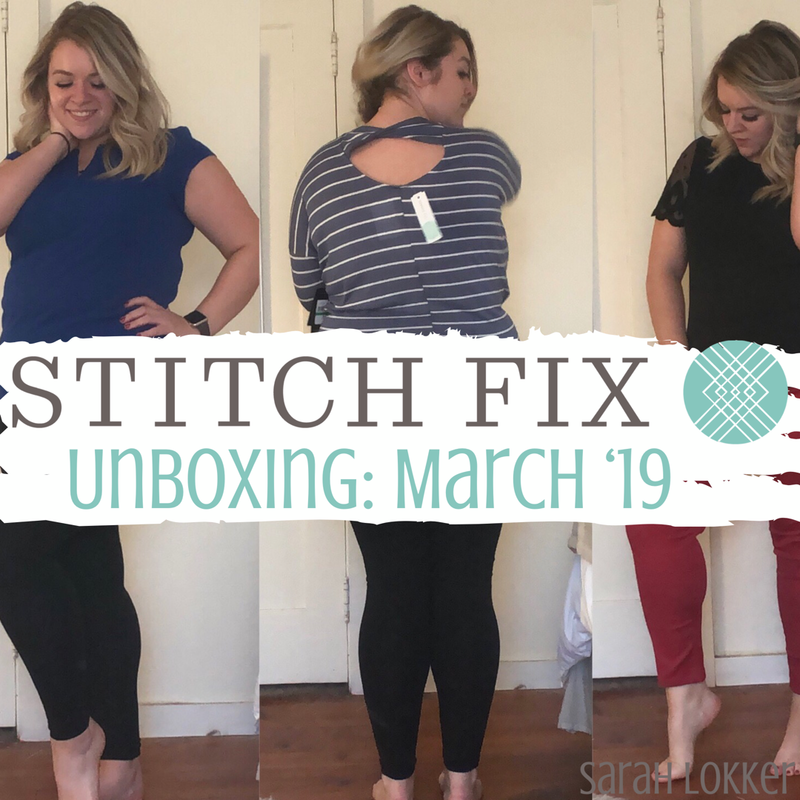 Everything in this month’s Fix subtotaled to $143.50, including the Buy All discount and styling fee purchase credit. Individually, pieces were a little more expensive, but including everything as a bundle doesn’t hurt the wallet as much. In my first-ever Fix, I had received a romper that I couldn’t squeeze myself into. Since then, my stylists have done an excellent job of finding pieces that accentuate my figure. 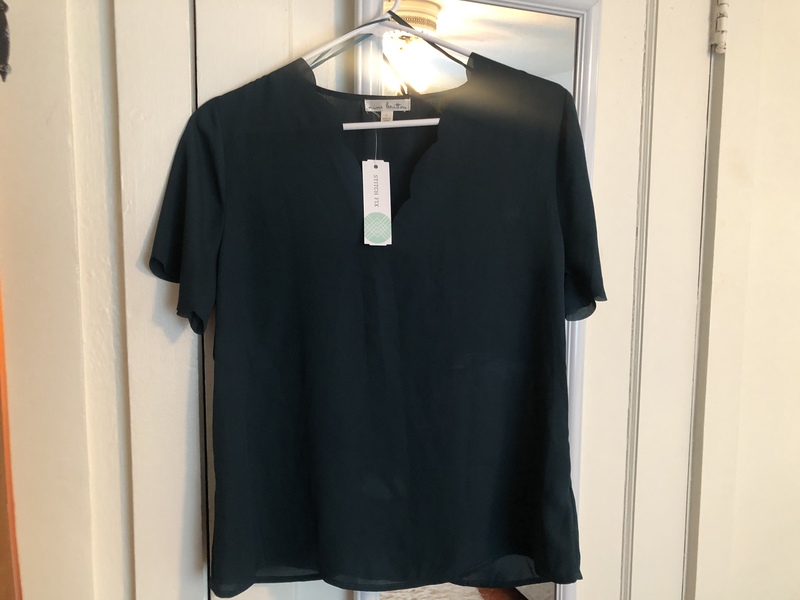 I LOVED this emerald green scallop blouse on the hanger, however there was zero chance of this fitting over my arms and completely scratch the idea of getting it over my chest! 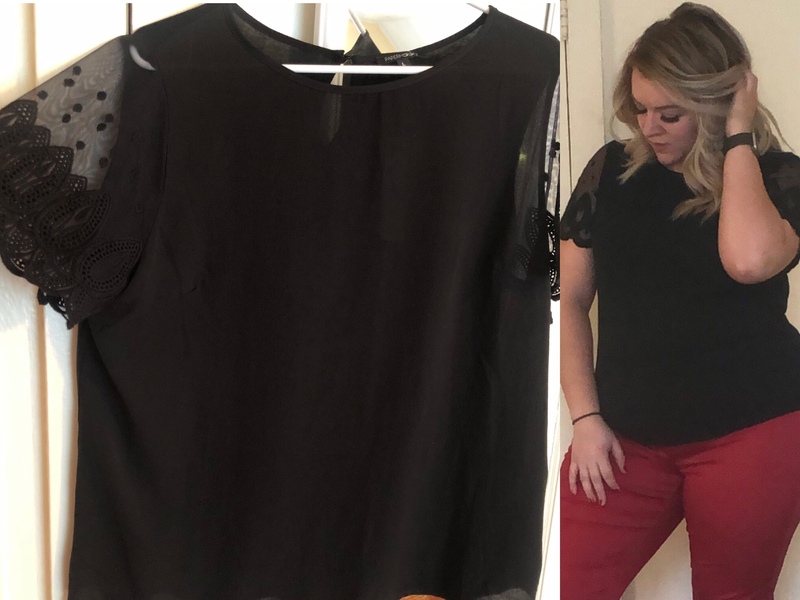 I don’t discredit Caitlin, because I think it’s because of the cut of this blouse: The scallop detailing and the material aren’t the most forgiving. I would have loved to return this and exchange for an XL or even a 2XL for a more billow-y fit, but it wasn’t available. This blouse would be a great transition to amp your springtime office wardrobe: A multi-colored stripe pencil skirt and pumps or a pair of flared black slacks and white cardigan are some starting points. One of my favorite pieces I’ve ever received in a Fix was one an Andrew Marc Performance shirt I didn’t think I would like. It goes to show it’s so important to try things on before you splurge. This one has the same cozy cotton material, but obviously the cut and the pattern are different. 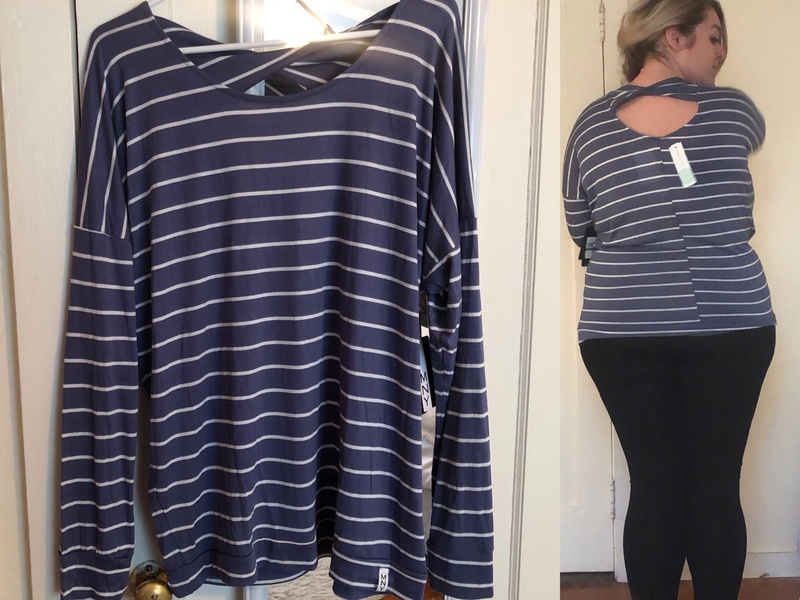 Normally I don’t opt for stripes because I’m wider (and the near 15 pounds I’ve packed on certainly don’t help), but I loved how comfortable this is, I could look past it. Plus, the light blue breaks up my neutral based closet. Since this is more of an athleisure piece, Caitlin suggested these with grey sweats and a military jacket, but if you’re looking to dress it up, wear it with a long duster cardigan and jeans. Despite popular belief, I do try to venture out from my typical black and experiment with some color, usually staying within the blues. This cobalt blue is gorgeous to transition from the navy blues of winter to bright spring colors! 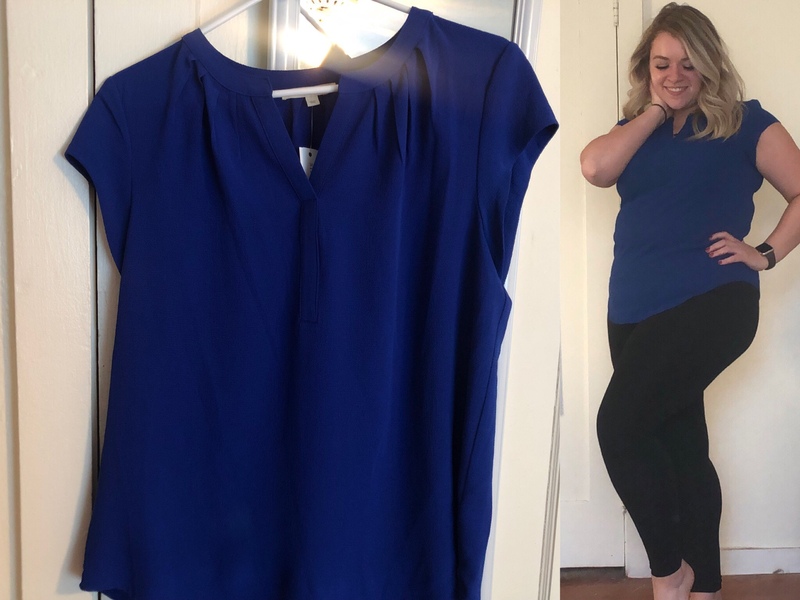 I’ve received a few cobalt blue shirts from previous Fixes, but I absolutely love the cut/fit of this one. It compliments and flatters me so well and has quickly become one of my favorites. The blouse can be rocked a few ways. A pair of jeans and a cardigan makes this a great brunch outfit with the girls, or you can pull out a swing skirt and grey suede pumps to wear to the office. Last year for my birthday, I had requested for some fun birthday dresses to wear in celebration, but with traveling and going through some personal things, I had zero time to make any suggestions to Caitlin. Thankfully, my girl was looking out for me and found this gorgeous blouse. Since I didn’t have any plans scheduled, this was the perfect solution for work/drinks with my co-workers/dinner with my family and best friend. The detailing of this top is what makes it, but the two-type material is comfortable and breezy. Caitlin picked this piece as a work wardrobe filler and suggested it with a floral skirt, leopard flats, a statement necklace and a trench coat or keep it simple with a pair of flared black slacks and black pumps. 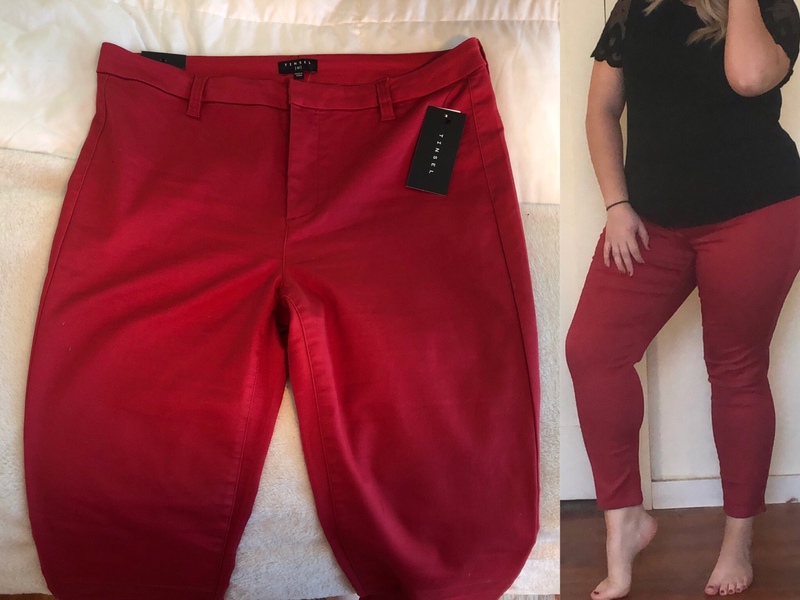 Caitlin thought she would pull me out of my comfort zone with these solid skinny pants, but the joke’s on her: I’ve been wearing brightly colored pants for years! I discovered Tinsel a while ago through a Fix and have been meaning to get my hands on more because they fit like a glove and are incredibly comfortable. These were no exception, but being that I already have a pair of Pixie pants from Old Navy that are identical, I had to pass. However, this did give me some inspo for those Pixie pants! Caitlin said to pull out a grey cardigan and black sleeveless blouse with slip-ons, or a white button down and a teal blazer. This entry was posted in fashion and tagged andrew marc performance, carmel solid skinny pant, clothes, fashion, Fashionista, fiah twist back knit top, frenkel scallop neckline blouse, fun2fun, haul, insta fashion, nine britton, OOTD, outfit inspo, outfit inspriation, outfit of the day, papermoon, plus sized, rhina mixed material lace detail blouse, sarah lokker, sarahhlokk, stitch fix, stitch fix unboxing, style, stylegram, tinsel, try on, walden split neck blouse. Bookmark the permalink.